Birla Temple is a popular architectural wonder of Jaipur. Located below the Moti Dungri Hill, Birla Mandir is easily accessible from the city of Jaipur. One can take local buses, rickshaws or can hire taxis to reach the Birla Temple. 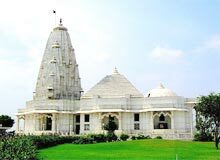 In 1988, the striking temple was built by Birla Group of Industries, a well-known name in the corporate sector of India. Made in pure white marble, Birla Mandir appears startling, when it gets lighten up in the night. Birla Temple of Jaipur is renowned for its fine carvings and delicate work.